In the tech world, the rich companies are getting richer, while the rest of the pack is basically staying still. 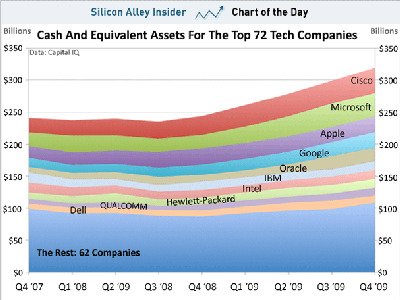 Data from Capital IQ reveals the 10 tech companies with the most cash and equivalents listed on the S&P 500 have $210 billion, while the next 62 tech companies from the S&P have just $108 billion in total. Further, as the WSJ notes, in the last two years the top 10 companies have broken away from the pack. The top 10 companies have added $68.7 billion over the last two years, while the next 62 companies have added just $9.7 billion.